I had a craving for carrot cake the other day. It was one of those cravings you try to ignore, but in the end you submit because, like it or not, you did not try all that hard to avoid it in the first place. Submitting to my desire also gave me the opportunity to play around with a recipe. I always enjoy that! I did not just want carrot cake, I wanted carrot cupcakes, and I did not just want carrot, I wanted carrot coconut. I do not bake with coconut often because my husband, and main test subject, dislikes the texture of it. Did I say dislikes? I mean loathes. Regardless of the likes of my husband my mind was set on carrot coconut, so on the way home from work I picked up a few things and set to work. 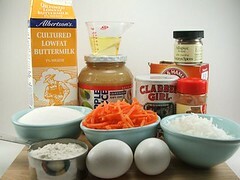 The original recipe for the carrot cake is my father’s. It is an excellent, moist, and very dense carrot cake, but I knew with all the eggs and oil it would make a very poor cupcake. 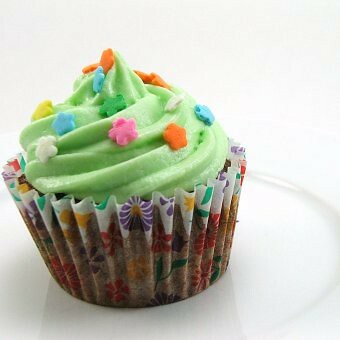 Besides, I hate getting a cupcake with a greasy liner! Yuck! So, I made some modifications, such as reducing the eggs, replacing some of the oil with applesauce, and adding some buttermilk to thin the batter and to add a slightly tangy note to the cakes. Adding the coconut helped add moisture along with the grated carrots, so in the moistness department I figured I was good. The original cake calls for 1 teaspoon of baking soda for a 9″x13″ cake which is quite dense. I wanted fluffy cupcakes that would dome proudly inside the liners so I added an additional 1/4 teaspoon of baking powder. 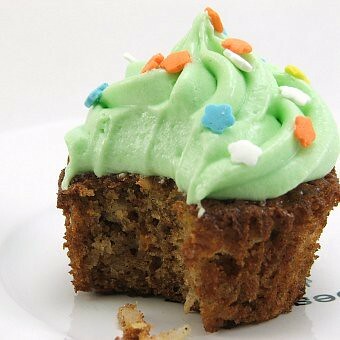 My modifications resulted in tender, moist, flavorful cupcakes with a slightly chewy texture from the shredded coconut. Even my husband, who avoids coconut like the plague, said they were pretty tasty … coconut aside. 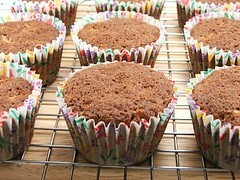 Heat the oven to 350F and line your cupcake pans with paper liners. 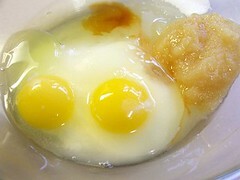 In a large bowl combine the sugar, eggs, oil, applesauce, buttermilk, and vanilla. Blend until smooth and well incorporated. In a smaller bowl sift the dry ingredients, then pour the dry onto the wet and whisk until the dry ingredients just moisten. 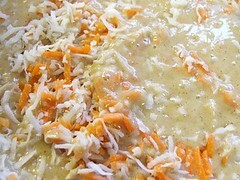 Add the shredded carrots and coconut and fold gently, making sure to scrape the sides and bottom of the bowl. Fill the cupcake liners 1/3 of the way full. 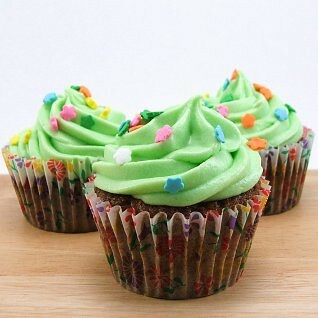 Bake for 25 – 30 minutes, or until the center of the cupcake springs back when lightly pressed. Allow the cupcakes to cool in the pan for three minutes, then turn onto a wire rack to cool the rest of the way. 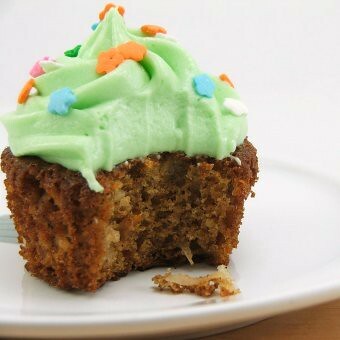 I frosted my cupcakes with a simple cream cheese frosting. Blend the butter and cream cheese on medium speed until well mixed, about five minutes. Add the vanilla and blend to combine. Add the powdered sugar and blend on low until the powdered sugar is moist, then blend on high for thirty seconds to remove any lumps. 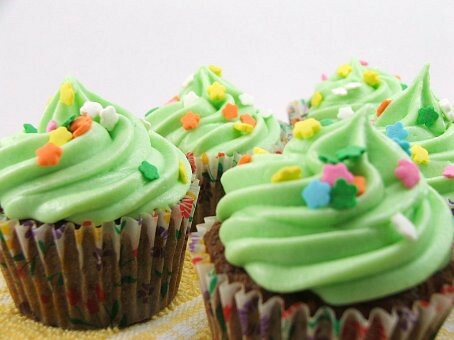 Store frosted cupcakes in the refrigerator.